Heat oven to 180C/160C/gas 4. Heat the oil in a large oven-proof casserole dish. Slash the skin on each thigh a couple of times and add the chicken, skin-side down, and brown well, all over – you can do it in batches. Remove from the pan and set aside. Lower heat slightly, add the shallots to the pan and cook until golden and soft but not burnt. Add the garlic and grated ginger and cook for 30 seconds before adding all the spices and cooking for 1 minute more. Now add the butternut squash into the pan and stir to coat in the spices. 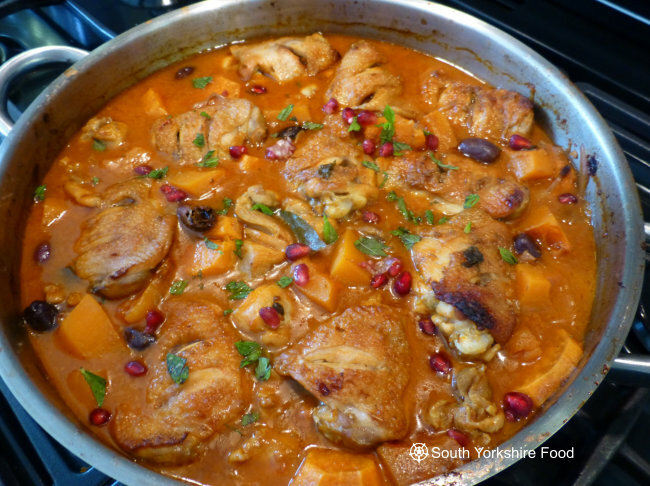 Arrange the chicken, skin side uppermost, on top of the shallots and squash and spice mix. Drizzle the honey over the thighs. Bring to a gentle simmer, cover and then transfer to the oven to bake for 40 minutes until tender. Scatter with the coriander and pomegranate seeds, and serve with couscous and a bowl of harissa.